13 Oct 2015 – Scottish Architects will no doubt be rooting for Reiach and Hall’s Maggie’s Cancer Caring Centre in Lanarkshire on Thursday – shortlisted for RIBA’s Stirling Prize 2015. This subtle and delightful building would be a deserved winner (clad in sumptuous ochre-coloured Danish bricks), it is many years since a Scottish building won (Scottish Parliament Building, and further back the Museum of Scotland was parachuted in having not been shortlisted!). 13 Oct – Architects have submitted plans to transform an abandoned office tower in Glasgow city centre into modern accommodation for hundreds of students, reports Construction News Scotland. 3D Reid said the application for Pegasus House will revitalise the redundant and almost entirely vacant office building. The completed project for Student Land and Development Ltd would offer 213 bedroom spaces within the existing volume in addition to an amenity space on top of the revamped podium. 13 Oct – Church Lukas have filed a number of internal amendments to their plans to build a huge student housing scheme at 240 Bath Street, including an increase in the number of rooms, reports Urban Realm. 13 Oct – Urban Realm has published the 2015 edition of the Architecture Scotland Annual , documenting a succession of public, housing, health, education, commercial, historic and interiors projects, reports Urban Realm. 13 Oct – Hub South West has reached financial close on the £32.5m Marr College project which will see the B-listed Troon School upgraded and extended with the addition of a new wing, reports Urban Realm. 8 Oct – Glasgow Urban Sports, the charity behind plans to build a sports sculpture park beneath the undercroft of the M74 at Port Eglinton, have released a new film documenting the rationale behind their proposal, reports Urban Realm. 12 Oct – Two of the six iconic Red Road towers remained partially standing due to an unforeseen difficulty, reports Construction News Scotland. The top half of two of the buildings remained standing at a slight angle after the bottom halves were destroyed. The delay meant that many of the 2,500 residents evacuated for the demolition returned home around an hour later than previously scheduled. RIAS President Willie Watt commented, “The last hundred years have seen two world wars, the heady days of the 1920’s and 1960’s, economic ups and downs and now a shared desire for sustainability”. Details moved up to 25 Oct news post. 12 Oct – The winning entries for the third group of design competitions to be built as part of the widely acclaimed Scottish Scenic Routes (old page linked, to be renewed soon) initiative have been revealed, reports Construction News Scotland. Judges selected two designs from a shortlist of four for sites within the Cairngorms National Park at the Devil’s Elbow and Tomintoul adjacent to the AA93 and the A939 respectively. The winners each receive a prize of £5000 and a mentoring package from a Cairngorms National Park Authority design team and the Construction Scotland Innovation Centre. 11 Oct – Hundreds of families set to be stranded overnight after botched demolition of Red Road flats. Glasgow’s Red Road flats to be demolished by explosion reports the BBC. Glasgow’s skyline will be changed later with the demolition: the six remaining high-rise blocks will be brought down together by controlled explosion. Several residents in neighbouring properties have refused to leave the exclusion zone put in place for the demolition. They told BBC Scotland they were concerned about damage to their properties. A controversial plan to demolish five of the blocks as part of the Commonwealth Games opening ceremony last summer was dropped. GHA said that after the controlled explosion 10 storeys of the blocks would remain and would be demolished using machinery at a later stage. “You will be pleased to hear that the council have backed the plan to turn the City Hall into a Market Hall. This has been grudgingly accepted by the council and a three month period has been given to Perth Market Place Ltd in order to satisfy the council that funding is in place for the venture. One can therefore be cautiously optimistic that the City Hall will be saved from demolition, and transformed into a building which can once again be used by the people of Perthshire….” – more on the Edinburgh Architecture site’s news page. 7 Sep – Plans have been unveiled for a £30m Radisson hotel on the River Clyde designed by ADF Architects. Forrest Hotels will soon submit a detailed planning application to Glasgow City Council for a 176-bed 4-star hotel with 78 parking spaces, bar, restaurant, Sky Bar, gallery, gym and more than 100sqm of event spaces, reports Scottish Construction News. The development will provide additional facilities adjacent to the SSE Hydro arena and SECC complex. The 10-storey Radisson Red building will have an exterior that will appear to change colour in reaction to natural light.The project will be the first new-build hotel in Europe run by the Radisson Group. Should planning permission be granted, work is due to commence on site early in 2016 with the hotel scheduled to open by September 2017. 4 Sep – Govanhill Housing Association and Collective Architecture have drawn up plans for 42 new homes for social rent on a brownfield site at the corner of Victoria and Butterbiggins Road, Glasgow, reports Urban Realm. Designed to frame the B-listed former Samaritans Hospital the scheme takes the form of a seven storey corner block descending toward shorter flanking ‘book ends’. 4 Sep – Collective Architecture has submitted plans for 31 houses for social rent and a children’s home at Muirskeith Road, Cathcart. Adopting the ‘gable form’ as a recurring design feature the scheme seeks to inject visual variety and interest to the street by projecting and recessing windows and doors, reports Urban Realm. It is intended to fully integrate the care home into the neighbourhood by adopting a domestic style that blends in with adjacent homes. 4 Sep – Communities get together to help revitalise town centres across Scotland as Stalled Spaces Scotland programme gets off the ground. Angus, Argyll and Bute, East Dunbartonshire, East Renfrewshire, Fife, North Ayrshire and Renfrewshire are all participating in the Stalled Spaces Scotland Programme. Each local authority has matched the funding provided by the central Stalled Spaces Scotland fund and have developed their own programmes. There has already been a number of projects funded during the first round however communities can submit innovative ideas for projects in the second round of funding. More detail of each programme and local application deadlines is available here. Drawing learning from the award winning Stalled Spaces initiative led by Glasgow City Council, Architecture and Design Scotland has been providing support and guidance for local authorities across Scotland to develop their own local Stalled Spaces Scotland initiatives. To align with the Scottish Government’s Town Centre Action Plan and the Town Centre First Principle the programme primarily looks at stalled spaces located within town centres to empower people to bring these spaces back into positive use for the benefit for the whole community. 2 Sep – The Walkie Talkie Building in London – 20 Fenchurch Street – designed by Rafael Vinoly Architects is the Building Design Carbuncle Cup Winner for 2015. The determining planning authority, “shamefully supported by CABE”, concluding that the proposals would cause “significant visual harm” and still granting permission. At e-architect we have appraised this bizarre building through its construction and have written critical reviews of its design. 2 Sep – A property development company which sued Scotland’s largest local authority for £15 million following a dispute over a contract to develop a site has had its claim dismissed as “irrelevant”, reports Scottish Construction News. PIP3 raised an action against Glasgow City Council for breach of contract after the local authority rescinded an agreement over the development of a site within the area designated for the 2014 Commonwealth Games. 1 Sep – Cancer charity It’s Good 2 Give has begun construction of a £1m three bedroom holiday home for the families of children with the disease. Designed on a pro bono basis by Kettle Collective the Ripple Retreat will take shape on the banks of Loch Venacher, offering short breaks for up to 40 families each year, reports Urban Realm. 31 Aug – The Royal Incorporation of Architects in Scotland (RIAS) has launched Architect in the Hoose to help homeowners and raise money for the Architects Benevolent Society (ABS). The scheme is simple – architects register to offer free, hour-long consultations to the public, in return for a small donation of £25 for the ABS. More details on the Edinburgh Architecture news page. 31 Aug – Councillors are to consider proposals for a new £333m Aberdeen Exhibition and Conference Centre (AECC) after full plans were submitted by developers, reports Scottish Construction News. Henry Boot Developments is to partner Aberdeen City Council on the public/private project at Bucksburn which includes a four-star hotel with restaurant and spa facilities. A 1,200-space underground car park as well as conference and exhibition space will also form part of the plans drawn up by Keppie Design. 28 Aug – Plans have been submitted to flatten the site of a former Aberdeen city centre pub and build a 100-room hotel and office development. Archial Norr have submitted proposals on behalf of Status Properties for a 4/5 star hotel and spa on the site which housed the former Budz Bar as well as the current Union Street offices of law firm Aberdein Considine, reports Scottish Construction News. The design statement for the application proposes fully retaining the street facing block of both of these C-listed buildings. Separate plans have been proposed for demolition including the former Budz Bar and the rear extension of the Aberdein Considine building. 28 Aug – Strathclyde Partnership for Transport (SPT) will today seek permission to spend nearly £1 million “future proofing” the office block at Scotland’s largest bus hub, reports the Evening Times. Members of the publicly-funded SPT will be asked to approve a spend of just over £906,000 to overhaul the heating and ventilation systems and fund additional repairs and alterations to the staff quarters at Buchanan Bus Station in Glasgow. The two storey office building which houses around 100 staff “is in need of refurbishment”. 26 Aug – Plans have been submitted by ADF Architects to transform Scotway House into a new complex for students. Developer Glasgow Harbour has lodged an application to convert the B-listed building in Castlebank Street into a bar and restaurant, acting as a ‘gateway’ feature to the wider development of 407 flats, reports Scottish Construction News. A former drawing office for engineering and shipbuilding firm D&W Henderson, the property was built in 1885 and is now on the Buildings at Risk Register. In 2002, demolition was proposed for the building and in 2005 Glasgow Harbour requested permission to dismantle and rebuild it in the heart of the development as a pub and restaurant. But, following discussions with Historic Scotland, it was decided the building should stay on its site. The new design by ADF Architects incorporates a 13 storey tower and low-rise block to form an entrance courtyard and enclosed private terrace and courtyard garden. 26 Aug – A ‘masterplan’ which includes plans to create a £25 million visitor resort with a ‘world-class’ five-star hotel on the northern slopes of Ben Nevis has been approved by The Highland Council. Produced by Forest Enterprise Scotland and Highlands and Islands Enterprise (HIE), the masterplan is the blueprint which could kick-start a positive transformation around Leanachan Forest, reports Scottish Construction News. • improved road access off the A82, better signage, car parking and landscaping and buildings to improve the whole visitor experience. 25 + 20 Aug – Our next Glasgow Architecture Walking Tour is planned for the 27th of August. Our most popular walk is through the city centre from The Mac to Homes for the Future, looking at key examples of contemporary architecture within the context of the historic environment. Our guides provide relevant information on the best buildings and their architects. An city centre tour typically takes 3 hours and is tailored to a group’s needs. we have been running tours since 2000. Over in the East we had an Edinburgh Architecture Walking Tour on Saturday August 22nd for a London architects office trip. Our last walking tour was on August 14th for a Dutch architects studio trip. 21 Aug – CRGP have submitted plans to extend the A-listed Queens Park Baptist church by creating a new link building connecting the existing hall and sanctuary by raising a new roof structure over an internal courtyard, reports Urban Realm. 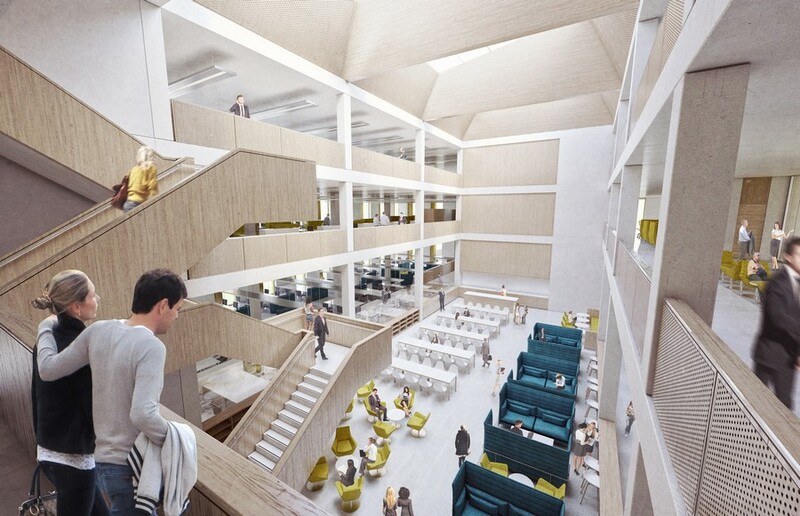 21 Aug – NHS Greater Glasgow & Clyde have announced a £40m modernisation plan for the Institute of Neurological Sciences within the Queen Elizabeth University Hospital campus, reports Urban Realm. The full programme of work is expected to conclude by 2017. 20 Aug – Plans to build a build a visitor centre on the old Military Road at the Rest and Be Thankful have been fueled by the backing of motorsport champion Sir Jackie Stewart, reports Urban Realm. 20 Aug – A £24m replacement Oban High School is set to be given the all clear after Argyll and Bute Council recommended that planning permission be granted for the new school, reports Urban Realm. 20 Aug – Plans have been submitted to Scottish Borders Council for a new gallery to house the Great Tapestry of Scotland, reports www.scottishconstructionnow.com. Glasgow’s Page\Park Architects have designed a two-storey building close to the train station in the village of Tweedbank where the new Borders railway is scheduled to terminate when it opens in September. The Great Tapestry of Scotland is the longest embroidered tapestry in the world at 143m long but lacks a permanent gallery space. The application from Page\Park includes plans for a reception, shop, temporary gallery and café built on the ground floor, with the tapestry itself located on the floor above. The main roof structure over the Tapestry Gallery would echo the flower of the thistle through a filigree of roof members and the display panel structure. The first floor of the visitor centre will be clad in precast concrete panels with cast-in artwork developed in conjunction with Andrew Crummy, the artist responsible for creating the tapestry within. 20 Aug – Funding has been approved for over £900m of infrastructure projects to be carried out under the Glasgow and the Clyde Valley City Deal package to boost the west of Scotland economy. 20 + 19 Aug – Construction of the £9m Engine Shed in Stirling redevelopment, is developing, transforming a former railway building into a world-leading education centre for building conservation in Scotland. 20 Aug – Work on a £15m Vox Dundee development will start towards the end of the year after councillors gave their backing for the development. The mixed-use transformation of a former Dundee college is by property developer Whiteburn Projects and architects are Keppie Design. 19 Aug – Glasgow Harbour has submitted plans for yet more student flats in Partick with proposals to erect 407 student rooms ; including conversion of the B-listed Scotway House, reports Urban Realm. 19 Aug – Entrants can choose to provide ideas for one more of the competitions. Information and full briefing materials for all three sites became available from 10 August on the Construction Scotland Innovation Centre’s website (www.cs-ic.org). First stage entries for all three sites are to be submitted by 24 August. There is no entry fee required from those wishing to take part in these competitions. 18 Aug – The finishing touches are currently being made to Glasgow’s latest student residential build, 257 bedroom scheme nestled within the Collegelands masterplan by Fresh Student Living, reports Urban Realm. Due to the high level of interest in this event the venue has now moved to Appleton Tower to allow more places to be made available. 14 Aug – Applications are being sought for the 2015 SURF Awards for Best Practice in ‘Community Regeneration’. Each year, SURF and the Scottish Government team up to highlight, share and celebrate success and innovation in efforts to improve the physical, social and/or economic fabric of disadvantaged communities across Scotland through the prestigious SURF Awards. This year, there are five categories of entry, which are designed to reflect the full range of regeneration activity: Scotland’s Most Improved Town, Large Scale Infrastructure, Employability, Creative Regeneration and Community Led Regeneration. 14 Aug – Original architectural drawings of the Usher Hall by the architects Stockdale Harrison & Sons – not seen in public since 1910 – are on display until 1 Sep for the first time in the concert hall. 14 Aug – An initiative designed to bring derelict and vacant land back into temporary is providing an array of projects including an outdoor gym, wildflower meadow and pop-up market, reports Urban Realm. Stalled Spaces Scotland is being delivered by Architecture + Design Scotland as part of a programme of events operating under the Lagacy2014 banner to empower local communities and revitalise town centres. 14 Aug – The University of Aberdeen has opened a £2m on campus nursery for the pre-school children of students and staff, the first fully certified Passivhaus building in Scotland to also attain a BREEAM ‘Excellent’ rating, reports Urban Realm. 13 Aug – Rhubarb Blue have submitted an application to demolish a funeral directors on Glasgow’s Minerva Street and build 13 flats together with associated parking beneath a landscaped amenity deck, reports Urban Realm. 12 Aug – Stallan-Brand have lodged a detailed planning application with Scottish Borders Council for Broomlands Primary, a new community school and early years facility in Kelso, reports Urban Realm. 13 Aug – Dundee City Council has published its planning and design guidelines for a £1bn waterfront masterplan following completion of the majority of infrastructure work, reports Urban Realm. 12 Aug – Argyll and Bute Council has submitted a planning application for a Ryder designed extension to the existing Kirn Primary, Dunoon, to accommodate up to 320 pupils and a 30 space nursery, reports Urban Realm. 11 Aug 2015 – Planning permission and listed building consent applications for a new council office building in Dumbarton have been submitted by Keppie, on behalf of West Dunbartonshire Council, 150 years after the foundations of William Lieper’s original Academy Building were laid. The project is being delivered by hub West Scotland in partnership with West Dunbartonshire Council, with architects Keppie and main contractor Lend Lease. 11 Aug – A plan to build 25,000 homes in Glasgow over the next decade has been welcomed by Scots housing developers. The city council has unveiled a strategy to provide enough houses in Glasgow by 2025 to meet the growing demand. It includes releasing land for development, bringing empty homes back into use and offering house hunters who can’t afford a deposit a 100% mortgage, reports the Glasgow Evening Times. 11 Aug – Titan Investors have submitted plans for a 10 storey office block at 200 Renfield Street offering 180,000 sq/ft of grade A accommodation, completing the redevelopment of an entire city block in Glasgow. The design is by Cooper Cromar Architects.Fronting the junction with Renfrew Street Broadway Two adopts a stepped profile to align with the lower frontage of the earlier Broadway One development, reports Urban Realm. 11 Aug – Work will shortly begin on a 14-month programme at Stirling station to deliver a £3m investment to upgrade and replace the glass roof and install safe access for future maintenance on the listed building. Bruce Crawford, MSP for Stirling, said: “I welcome this investment in Stirling station and it’s good to see work getting started. As well as looking forward to improved services and faster journey times on routes to Glasgow and Edinburgh being enabled by electrification, it is important that there is also work being done to improve the stations. Work begins to install the 2,440 square metre polycarbonate glazed roof from August 17 and will be completed by November 2016. It will be delivered in phases to minimise the impact on the operation of the station and hoardings will be in place throughout to physically separate the work from public areas in the station. There will be no disruption to train services through the station during this work. 11 Aug – An abandoned RAF base perched on a cliff edge overlooking the Forth is set to become a new home for a high flier with it being offered for sale with full planning permission for £3.5m, reports Urban Realm. 11 Aug – A stalled £20m office development in Aberdeen has been reworked to accommodate 337 student rooms following a rethink by developer Dandara. The design is by Aberdeen architects Halliday Fraser Munro, reports Urban Realm. (Ed. I worked on a scheme for Triple Kirks back in the Summer of 1989 whilst at the William Cowie Partnership in Aberdeen). 10 Aug – A man and woman have been treated in hospital after they were hit by falling masonry in Paisley, Renfrewshire. They were struck by material which fell from a building near Greggs, in the town’s Moss Street, at about 12:15 on 10th August. 7 Aug – Two new primary schools designed by Holmes Miller from Hub East Central Scotland in Crieff and Perth have been completed, reports Urban Realm. The £18m project for Perth & Kinross Council by BAM construction will jointly accommodate around 1,000 nursery and primary pupils. 6 Aug – The Heritage Lottery Fund has endorsed a £6.1m outline bid to redevelop Kilmartin Museum, Argyll, after awarding the project with a £400k grant and agreeing to consider a separate £3.1m funding request, reports Urban Realm. The design is by Reiach & Hall Architects. Situated in Kilmartin Glen, an area rich in Bronze Age and Neolithic artefacts, the museum tells the story of 800 monuments within a 10 mile radius. Expansion plans will allow more artefacts to be displayed via a new exhibition gallery, whilst a temporary exhibition space will also be created. 3 Aug – The GIA are pleased to announce that the GIA Design Awards 2015 are now open for entry. The usual rules apply, please submit via the website and send your images on CD. Further details can be found on the entry page. If you have any questions, please contact communications@gia.org.uk. 3 Aug – The three competitions are open to young architects who are still within five years of completing RIBA Part II or, for landscape architects,within five years of achieving of Graduate status. This is the final phase of the Scottish Scenic Routes pilot project and with four installations completed to date, two more about to go on site, the three new competitions provide an important opportunity for the best of Scotland’s young talent to show off their skills. The full brief and conditions will be available from Monday 10 August on the Construction Scotland Innovation Centre’s website (www.cs-ic.org).